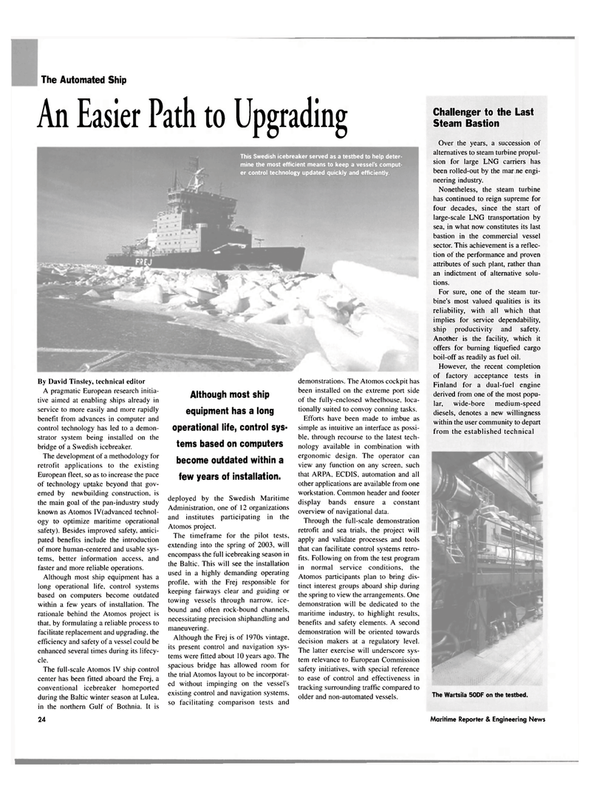 A pragmatic European research initia- tive aimed at enabling ships already in service to more easily and more rapidly benefit from advances in computer and control technology has led to a demon- strator system being installed on the bridge of a Swedish icebreaker. European fleet, so as to increase the pace of technology uptake beyond that gov- erned by newbuilding construction, is the main goal of the pan-industry study known as Atomos IV(advanced technol- ogy to optimize maritime operational safety). Besides improved safety, antici- pated benefits include the introduction of more human-centered and usable sys- tems, better information access, and faster and more reliable operations. Although most ship equipment has a long operational life, control systems based on computers become outdated within a few years of installation. The rationale behind the Atomos project is that, by formulating a reliable process to facilitate replacement and upgrading, the efficiency and safety of a vessel could be enhanced several times during its lifecy- cle. The timeframe for the pilot tests, extending into the spring of 2003, will encompass the full icebreaking season in the Baltic. This will see the installation used in a highly demanding operating profile, with the Frej responsible for keeping fairways clear and guiding or towing vessels through narrow, ice- bound and often rock-bound channels, necessitating precision shiphandling and maneuvering. Although the Frej is of 1970s vintage, its present control and navigation sys- tems were fitted about 10 years ago. The spacious bridge has allowed room for the trial Atomos layout to be incorporat- ed without impinging on the vessel's existing control and navigation systems, so facilitating comparison tests and demonstrations. The Atomos cockpit has been installed on the extreme port side of the fully-enclosed wheelhouse. loca- tionally suited to convoy conning tasks. Efforts have been made to imbue as simple as intuitive an interface as possi- ble, through recourse to the latest tech- nology available in combination with ergonomic design. The operator can view any function on any screen, such that ARPA, ECDIS, automation and all other applications are available from one workstation. Common header and footer display bands ensure a constant overview of navigational data. Atomos participants plan to bring dis- tinct interest groups aboard ship during the spring to view the arrangements. One demonstration will be dedicated to the maritime industry, to highlight results, benefits and safety elements. A second demonstration will be oriented towards decision makers at a regulatory level. The latter exercise will underscore sys- tem relevance to European Commission safety initiatives, with special reference to ease of control and effectiveness in tracking surrounding traffic compared to older and non-automated vessels. Over the years, a succession of alternatives to steam turbine propul- sion for large LNG carriers has been rolled-out by the mar ne engi- neering industry. Nonetheless, the steam turbine has continued to reign supreme for four decades, since the start of large-scale LNG transportation by sea, in what now constitutes its last bastion in the commercial vessel sector. This achievement is a reflec- tion of the performance and proven attributes of such plant, rather than an indictment of alternative solu- tions. For sure, one of the steam tur- bine's most valued qualities is its reliability, with all which that implies for service dependability, ship productivity and safety. The Wartsila 50DF on the testbed. This Swedish icebreaker served as a testbed to help deter- mine the most efficient means to keep a vessel's comput- er control technology updated quickly and efficiently.